The story of Semyon Lavochkin's excellent radial-engined fighter is one worthy of good fiction. In a gripping sequence (which would repeat itself on the other side of the continent two years later with the Japanese Ki-100) the very disappointing, near-death-trap inline-engined LaGG-3 fighter had its powerplant swapped in desperation for a bigger radial, totally transforming the airplane from crap into a world-class warhorse, just in time for the crucial struggle at Stalingrad. In the atmosphere of place and time, this turn of events also may well have saved Lavochkin's life. The initial 'razorback' La-5 was converted directly from unfinished LaGG airframes (Bill Gunston reporting, "many were mere lumps in the snow, some not discovered until the spring thaw...."). This lash-up formula was succeeded on the production lines with the La-5F, which had its rear decking cut down to improve the pilot's view to his six, and finally a fuel-injected engine and visible refinements to the carburetor intake on top of the cowl and elsewhere produced the La-5FN. This lineage would see its ultimate form in the highly cleaned-up La-7, which sported a completely redesigned forward fuselage and wing center section. But for the remainder of the war the most prolific members of the family would remain the -5 series, which bore the bulk of the fighting and whose numbers would ultimately be nearly equal to the La-7 and LaGG-3 combined. Apart from a static replica in Russia (which may contain some original Lavochkin parts) and a cockpit section relic last seen in Florida, there are no known survivors. For many years, the go-to kits in 1/72 for this eminent fighter were the KP and Italerei examples of the La-5FN from the late 70s/early 80s, plus an La-5 ten years later from some anonymous Russian mold maker which was released primarily under the Condor label. None were bad (the Russian one being the best), but had minor, hard-to-correct fidelity issues and the overall lack of detail of the era. 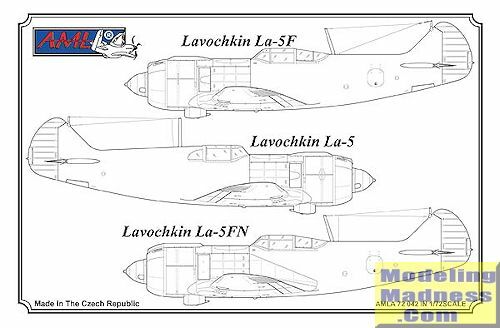 Then around 2006, the Czech firm AML released $25 short-run kits of all three La-5 sub-variants, with resin and photoetch where appropriate. Reviews were generally positive. I have no idea how well this kit sold. But for some reason, AML got a bug up its you-know-where and decided last month (Sept. '15) to offer us geeks all threeversions in one box with the resin and photoetch--for a retail of less than $15 US. Yep, you read that correctly. So what does one get for his fifteen beans? 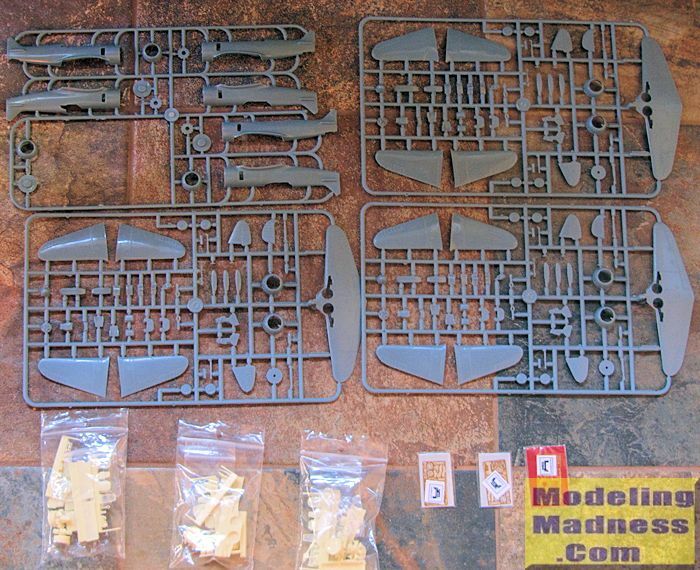 Four sprues in soft, shiny gray plastic: one unique for the cowl rings and 3 different fuselages, three identical ones to cover flying surfaces, prop, and landing gear parts, plus optional upper wing parts. Three bags of nicely rendered tan resin, each specified to a particular sub-variant , primarily for engine and cockpit detail. This bag also contains the canopy and photoetch fret. Surface detail is really good, with fine recessed panel lines and raised panels, especially appropriate at the mid-span wing joints. This is a low-pressure injection kit of its era, so expect main parts which require 'fitting'. I couldn't resist the urge and picked the -5F, prepping the mating surfaces of the main parts with a nail file and some minor knife trimming, then taping them together. The result is an attached image, shown after five minutes' fitting work. No major heartburn here, except the upper wing root may need to be forced into place while the cement cures to prevent a step. 1) The thick resin cockpit sidewalls and wheel wells are going to require an industrial-grade sanding to fit against the equally thick plastic parts to which they tango. I may well ditch them and scratch build. 2) You're on your own as far as mounting the prop goes. AML supplies a mounting plate with a raised cylinder representing the central engine gearbox fairing, but it's out-of-round and too short. I'll be concocting something out of telescoped brass tubing and thick styrene with my Dremel and drill press. However, a shortcut could be had by using the supplied optional plastic closed-cooling-baffles disc, cementing it directly to the cowl ring interior, then mounting the prop directly on that. By the way, that beautiful resin engine can be chucked into your spares box, as on the real thing (like on the Fw-190) it was obscured by said cooling devices and that long gearbox fairing. Then there's the minor things organic to kits of this sort: the prop blades' shape could do with a little refining, the gun bumps and carb intake need their height reduced quite a bit. According to photos I have seen of the finished model, the stance might be a bit too proud. Also, you'll need your references to figure out what goes where in the cockpit. La-5 sans suffixe: 'razorback' canopy, resin parts with short carburetor intake, upper wing parts w/o root detail. 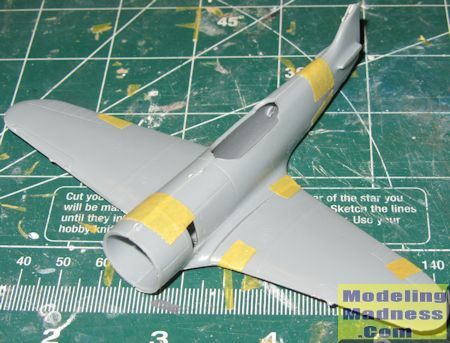 La-5F: long canopy, resin parts with short carburetor intake, upper wing parts w/o root detail. La-5FN: long canopy, resin parts with long carburetor intake, upper wing parts with root detail. The lack of instructions shouldn't be a deterrent--after all, this kit is targeted at those who don't use them anyway! Soviet markings are not hard to cobble up from the spares box, but if this has you concerned Print Scale offers a sheet (#72011) with several options for each of the three versions. None of these critiques are meant to detract from the fact that this is one heck of a great package, and I hope AML is rewarded for such boldness with brisk sales. The real proof, however, will be in the pudd'n. Stay tuned!